We're now six months into 2007 and there have been a lot of news about new anime publications hitting retailers. From Isaac Alexander comes a brief overview of news from last year from where the last report left off. One addendum to the previous report: The report neglected to include two new publications that were starting at the end of 2005. The Monash Caulfield Anime Club in August 2005 premiered their first issue of Animaverick, Australia's first homegrown anime magazine covering anime, manga, and J-pop in the land down under. Across the Indian Ocean west of Australia, the company Xvolve Publishing premiered the first South African publication called Otaku Magazine. As of this time, both publications are only available in their host nations. Jumping to the present day, but back across the Indian Ocean, Singapore saw an anime magazine fold, and another one premier. The company behind the magazine M.A.G.E. chose to end the publication in late 2006 to focus more on its retail operation. This past spring, Orgnix Studios stepped up to fill the void by publishing Fresh Mode, which previews manga from local Singapore creators in each issue. The magazine also covers anime, manga, and J-Pop from Japan. Free publications devoted toward anime and manga seems to be the new trend, as there are now four of them in North America. Animerica continues to be distributed in Borders/Walden Bookstores in North America while Tokyopop Manga Magazine is available through mail and at conventions. One of the new publications that came out in 2006 was Janime. Its layout is that of a free community newspaper you would find at your local grocery store or library, but with content about anime and J-pop news from Japan. The other unique thing about this publication is that it's distributed solely at anime conventions and festivals across North America. In spring of 2007, the company behind Janime began publishing a free sister monthly magazine called PopJNeo. This publication will also be released for free at anime conventions. In the U.K. Neo Magazine continues to be the vanguard of anime and Japanese Entertainment for the nation. Anime Insider and Newtype USA continue to be the largest circulated magazines in North America. Beckett Anime continues its niche of covering anime for a younger demographic as well as anime card games. The anime toy retailer Super 7 carries on with its magazine of the same name. 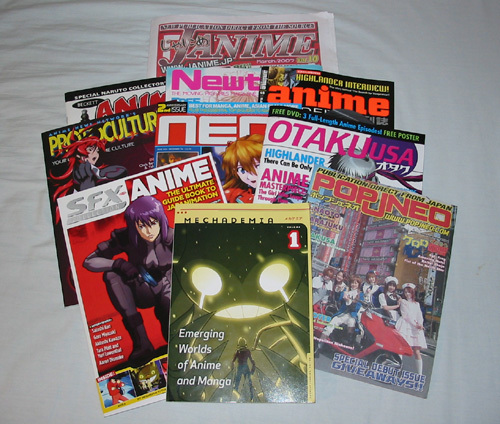 The magazine ProtoCulture Addicts, which is now full-color, continues to grow and expand as a result of it being purchased by Anime News Network. Mechademia's inaugural issue came out right before Christmas of 2006. The journal is published more like a soft-cover book, and the people behind the magazine are already accepting submissions for their third issue. Otaku USA magazine premiered in June from Sovereign Media. The Editor-in-chief, Patrick Macias, who has written books on anime, is leading this new bi-monthly magazine. The amount of extras included with this publication (DVD, Poster) puts it in the price range just below that of Newtype USA. Science fiction magazine SFX Collection of the U.K. released a special issue devoted to anime in 2006. The special issue covered various anime titles that have come out through the years, as well as numerous articles and interviews of Studio Ghibli. In January 2007, 3D World Magazine also released in the U.K. a special issue on anime. The issue contained an article on how to create anime-hair as well as a feature on Studio Ghibli's newest titles. Beside the anime-devoted publications above, there are other magazines that either regularly include anime/manga stories and reviews, or a special issue devoted to the subject. Here are some examples: Animation Magazine, Giant Robot, Play Magazine, Rocket Magazine, Scifi Magazine, Super 7, The Comics Journal, & Wizard. The magazine Frames Per Second (a.k.a. fps) has also had regular anime coverage. The publication switched from a print to a online publishing format (PDF) in 2005. Diamond Comics Previews continued its March roundup of manga and manhwa publishers and their catalogues. ICV2 has their quarterly magazine devoted towards pointing out what type of otaku merchandise retailers should look out for. Kidscreen magazine covers the business side of entertainment and covers licensing announcements and issues. Submitted by gum on Sat, 2007-06-30 17:25. I'm a big comic book collector and since everybody knows about my passion this year my friends decided to make me happy by putting up a party where all the artificial Christmas trees were dressed with mangas instead of traditional things. It was my best Christmas ever. I'll submit some pictures as soon as I can.